Machu Picchu (Quechua: Machu Picchu) – "Old Mountain", pronounced [ˈmɑ.t͡ʃu ˈpix.t͡ʃu]) is a pre-Columbian Inca site located 2,430 metres (7,970 ft) above sea level. It is situated on a mountain ridge above the Urubamba Valley in Peru, which is 80 kilometres (50 mi) northwest of Cuzco and through which the Urubamba River flows. Most archaeologists believe that Machu Picchu was built as an estate for the Inca emperor Pachacuti (1438–1472). 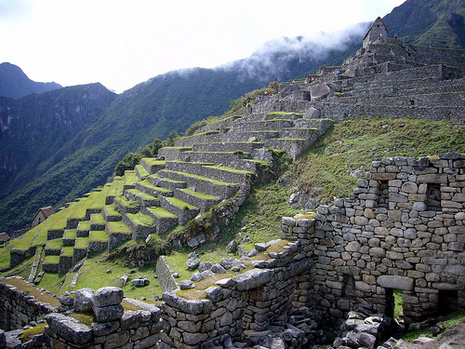 Often referred to as "The Lost City of the Incas", it is perhaps the most familiar icon of the Inca World. The Incas started building the estate around AD 1400 but it was abandoned as an official site for the Inca rulers a century later at the time of the Spanish conquest of the Inca Empire. Although known locally, it was unknown to the outside world before being brought to international attention in 1911 by the American historian Hiram Bingham. Since then, Machu Picchu has become an important tourist attraction. 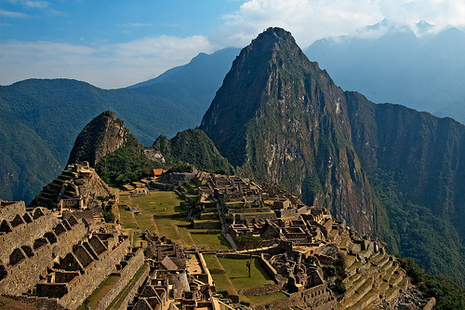 Machu Picchu (which means "Old Peak") was most likely a royal estate and religious retreat. 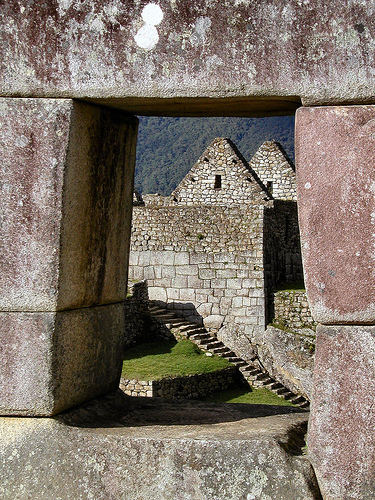 It was built between 1460 and 1470 AD by Pachacuti Inca Yupanqui, an Incan ruler. The city has an altitude of 8,000 feet, and is high above the Urubamba River canyon cloud forest, so it likely did not have any administrative, military or commercial use. 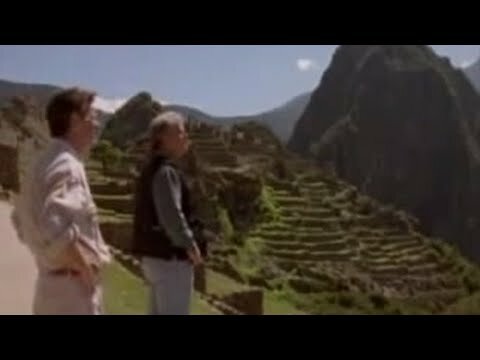 After Pachacuti’s death, Machu Picchu became the property of his allus, or kinship group, which was responsible for it’s maintenance, administration, and any new construction. Nowadays it is a Historic National Sanctuary, protected by the Peruvian Government by means of Law Nº 001.81.AA of 1981, that tries to conserve the geological formations and archaeological remains inside the Sanctuary, besides protecting its flora, fauna and landscape's beauty. The whole park has an extension of 32,592 Has. ; that is 80,535 acres(325.92 km²; 125.83 mile²). Machupicchu (the Inkan City) is located on kilometer 112 (70 miles) of the Qosqo-Quillabamba railway; the train station is known as "Puente Ruinas" and lies at an altitude of 2000 mts (6560 ft.). From that station there are buses in order to get to South-America's most famous Archaeological Group that is found at an average altitude of 2450 mts (8038 ft.), and at 13°09'23'' of South Latitude and 72°32'34'' of West Longitude. The climate in that sector has also some characteristics that are found all over the region; thus, only two well defined seasons are distinguished: the rainy season between September to April, and the dry season from May to August. Nevertheless, Machupicchu is found by the commencement of the Cusquenian Amazonian Jungle, so the chance of having rains or showers is latent by any time of the year. In the hottest days it is possible to get even about 26° Celsius (78.8° Fahrenheit), while that in the coldest early mornings in June and July the temperature may drop to -2° C. (28.4° F); the average annual temperature is 16 degrees Celsius. Annually, there is an average of rains from 1571 mm. (61 in.) to 2381 millimeters (93 in.). It is obvious that the monthly relative humidity is in direct relationship to rains, so the humidity average is from 77% during the dry months to 91% in the rainy months.